As parents, we do all that we can to ensure the safety of our children. Car seat is very useful for baby's safety. That is very true -- that's why I'm a proponent of extended rear facing. I have, actually, brought the Boychick in, asleep, in the carseat... in his Boulevard (that's a non-bucket convertible for those that don't know -- we too had a 10+ lb baby who did just fine in the convertible from week one). He slept for two hours, me rocking him by foot in his seat placed in the rocking chair. One of the more memorable moments of his babyhood, although not one I was anxious to repeat again. On another note, the other legitimate use I've heard for the bucket seats is being able to transport baby in and out of the car fully covered and warm in a very cold environment. Having only parented in the Pacific Northwest, I will take their word for it that it's the saner of the options available, though I also know it's a minority of the times a bucket gets used, and thus doesn't address the legitimate criticism of the overuse of buckets in general. arwyn: I'm picturing you lugging in your Boulevard -- hilarious, and amazing he slept through the transfer. We also had one of those large babies who didn't need a smaller seat! I love meeting members of the pudgy-baby club. Oh, I HATE it when people carry their babies in the car seat. It's like they are afraid to touch their child! So afraid, in fact, that they'd rather lug around the extra, very awkward, back-breaking weight. For some reason, my husband did this a few times when our son was a newborn, and I complained so much that he stopped. I don't get it. Do they think it's cool or something? I guess they just are hoping the baby will fall asleep in it, which is dangerous! Hmm...just like making a baby sleep alone is dangerous. People will rather risk their little one's life than break from the mold. Ugh, I just feel so bad for the babies. I hate to burst everyone's bubble but without a carseat a lot of babies would be dead. There are no perfect drivers. After being in a car accident when my child was very young less then one the car seat saved his life. The car seat is the safest place for your child when you are in a car not in your lap! Hi, anonymous — No one's suggesting not using a car seat in the car! It's the carrying around out of the car that's the problem. Here's a quote from my article above: "I want to stipulate that I have no problem with infant car seats used in a car. Hooray for you for keeping your child safely buckled in." I'm a proponent of extended rear facing and general car safety, but that's not what this post is about. Thanks for helping to clarify that, though. I am just seeing this post now and had to comment. We sell baby slings at work and there are frequently people who say "oh, it scares me to death to see women carrying their babies in THOSE THINGS. It looks like the baby could just fall right out!" I just want to say "Well, it scares ME when you leave your newborn on the floor by our front door in a bucket while you shop. It looks like someone could just step on him!" Or a child could cough on him, or a stranger could walk off with him. 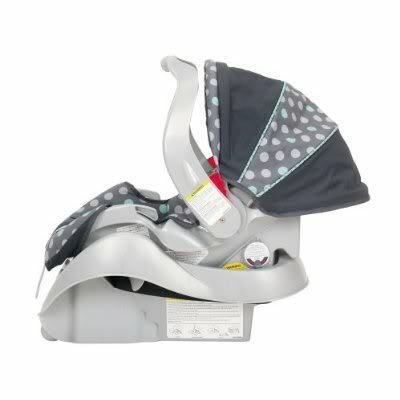 I have to admit, we used the car seat carrier at times (mostly in the winter so our daughter could stay covered or because she was asleep) but we never left her sitting around. And the funniest thing is, most of those carriers (plus baby) are considered too heavy for a freshly postpartum mom to lift. They are just not practical! Good to know that the Roundabout will work for a newborn though. We recently bought one of those and a Recaro convertible seat and were wondering if we'd have to use a bucket for a few weeks. That's funny! It's strange what seems dangerous or inconvenient to people — I usually have very different ideas. :) A sling or wrap spreads the weight out so nicely, but you'll often hear moms suppose that wearing their baby would hurt their backs vs carrying one of those heavy plastic things. ?? I will fully admit that we live in a mild climate, so I can't speak for the usefulness of keeping baby covered up in winter. That makes sense to me. I'm thinking the Roundabout's weight minimum (5 lbs) would work for any newborn but a preemie, so I guess it would just depend how tall your newborn's torso is in terms of whether the minimum height will work. The lowest strap holes need to be at or below the shoulders. So here's hoping you'll be able to use your convertibles, but in the worst-case scenario, you'll have to run out and buy a bucket. At least they're pretty cheap. Was your first daughter on the bigger side? We did have to tuck cloth diapers around our newborn's head to offer a little more neck support, but otherwise he looked comfy. The scariest thing I saw when I was pregnant with my twins was a couple entering the doc's office when I was leaving. The dad was toting TWO buckets for their two babies. He was the size of your average linebacker. I, however, am 5'2.5" and pretty small-boned. I almost started hyperventilating at the sight -- how would I carry my babies? Yep, in a sling (or two). Wish I had a dollar for every time someone would say, OMG, aren't they heavy? Not as much as 2 seats + 2 kids, lady! My baby went home in a convertible car seat, too. After losing his initial 10% bodyweight, he was only 5 lbs. 11 oz! Sooo little. And yet, he fit in his First Years True Fit nicely. Did I mention it was -11F that day? Yeah. He was fine. I bundled my parka around us both, I did. I always feel sad when I see babies chillin in their car seats. It's like, "I'll hold your baby if you don't wanna!" roxanne: All I can say is: Oof! I didn't even think about carrying twins in those stupid buckets. kacie: Aw, what a sweet little snuggly baby you must have had! And as to your last sentence: YES!! That's exactly what I always feel. I have to stop myself from reaching in and snatching up their child. Ditto on everything you said. I have always thought carrying the baby buckets (yuck) looked so awkard, so hubby and I bought only convertable car seats. And the only advantage of the infant seats I've heard is the sleeping baby thing you mentioned. I do feel a little sad when I have to wake my daughter to take her out of the car, but I figure it's a small price to pay. Besides, she almost always goes back so sleep once I put her in the sling. I want to yell at parents "Pick up you baby!" whenever I see a babe, awake or sleeping, in a carseat outside the car. I found that I generally had don't-wake-the-baby success if I pulled her directly from her car seat to my waiting breast. That's right, not just in my garage, but often outside I whipped out by breast before picking up my child. Then I'd carry her inside and lie on the floor with her while she settled back to solid sleep. Though with my first I would unlatch the entire convertible car seat rather than wake her. My other concern with leaving babies in the seats is that they hold so much heat! With Sasha rear-facing she gets no A/C except what floats over and onto her legs. Her legs get cold, but I pick her up and her back is sweating. Poor dear. The way the seats curve around your baby there is just no good airflow. I get annoyed every time I see someone carrying their baby in one of those car seats! It's like, how about just hold them! Or wear them. Literally every time I see it I'm bothered. Especially when the mother props up the bottle while the baby is laying inside. I've refrained from saying something (on numerous occasions ) but God do I want to. Just hold them and wear them and love them!